Mary Temple Grandin was born in Boston, Massachusetts, into a very wealthy family. One of the Irish girls who worked for the family was also named Mary, so Grandin was referred to by her middle name, Temple, to avoid confusion. Her mother is Anna Eustacia Purves (now Cutler), an actress, singer and granddaughter of the co-inventor for the autopilot aviation system (John Coleman Purves), with a degree in English from Harvard University. Her father was Richard McCurdy Grandin, a real estate agent and heir to the largest corporate wheat farm business in America at the time, Grandin Farms. Grandin's parents divorced when she was 15, and her mother eventually went on to marry Ben Cutler, a renowned New York saxophonist, in 1965 (when Grandin was 18 years old). Her father Richard died in California in 1993. Grandin is the eldest of four children and has three younger siblings: two sisters and a brother. Grandin has described one of her sisters as being dyslexic. Her younger sister is an artist, her other sister a sculptor, and her brother a banker. John Livingston Grandin (Temple's paternal great-grandfather) and his brother William James Grandin, were French Huguenots who drilled for oil, intending to cut a deal with John D. Rockefeller, but the latter kept him waiting too long so he walked out before Rockefeller arrived. Then they went into banking and when Jay Cooke's firm collapsed they got thousands of acres of undeveloped land in North Dakota as collateral. They set up wheat farming in the Red River Valley with dormitories for the workers; the town of Grandin, North Dakota, is named after John Livingston Grandin. Although raised in the Episcopal religion, Temple Grandin early on gave up on a belief in a personal deity or intention in favor of what she considers a more scientific idea of God. Contrary to widely published reports, Grandin was never formally diagnosed with autism in childhood or in youth. The only formal diagnosis received by Grandin was of 'brain damage' at the age of 2, a finding corroborated subsequently when she was 64 years old, by cerebral imaging carried out in 2010 at the University of Utah. When Grandin was in her mid-teens, her mother chanced upon a checklist on autism published by Dr. Bernard Rimland, a renowned American psychologist and founder of the Autism Research Institute. Completing the checklist, Grandin's mother hypothesised that Grandin's symptoms were best explained by autism. A formal diagnosis consistent with being on the autistic spectrum was made only when Grandin was in her 40s. Grandin was later determined to be an autistic savant as well. Grandin's mother, Eustacia, took her to the world's leading special needs researchers at the Boston Children's Hospital, with the hope of unearthing an alternative to institutionalization. Grandin's mother eventually located a neurologist who suggested a trial of speech therapy. They soon hired a speech therapist, and Grandin received personalized input from the age of 2 and a half. A nanny was also hired when Grandin was aged 3 to play educational games for hours with her. Grandin started kindergarten in Dedham Country Day School. Her teachers and class strove to create an environment to accommodate Grandin's needs and sensitivities. Grandin considers herself fortunate to have had supportive mentors from elementary school onward. Even so, Grandin states that junior high and high school were the most unpleasant times of her life. The medical advice at the time for a diagnosis of autism was to recommend institutionalization, a measure that caused a bitter rift of opinion between Grandin's parents. Her father was keen to follow this advice while her mother was strongly opposed to the idea as it likely would have caused her to never be able see her daughter again. Grandin attended Beaver Country Day School from 7th to 9th grade. She was expelled at the age of 14 for throwing a book at a schoolmate who had taunted her. Grandin has described herself as the "nerdy kid" whom everyone ridiculed. She has described occasions when she walked down the hallways and her fellow students would taunt her by saying "tape recorder" because of her habit of repetitive speech. Grandin states, "I could laugh about it now, but back then it really hurt." The year after her expulsion, Grandin's parents divorced. Grandin's mother remarried three years later to Ben Cutler, a New York saxophonist. At 15, Grandin spent a summer on the Arizona ranch of Ben Cutler's sister, Ann, and this would be a formative experience towards her subsequent career interest. Following her expulsion from Beaver Country Day School (reports vary on the actual name of the school Grandin was expelled from, with Grandin herself noting it to be Cherry Falls Girls' School in her first book, Emergence: Labelled Autistic), Grandin's mother placed her in Mountain Country School (now known as Hampshire Country School), a private boarding school in Rindge, New Hampshire, for children with behavioral problems. It was here that Grandin met William Carlock, a science teacher who had worked for NASA, who would become her mentor and help significantly towards building up her self-confidence. It was Carlock who gave Grandin the idea to build herself a hug box (referred to as a "squeeze machine" by Grandin) when she returned from her aunt's farm in Arizona in her senior year of high school. With Carlock's assistance, Grandin built her hug box at the age of 18 when she was still attending Mountain Country School. Carlock's supportive role in Grandin's life continued even after she left Mountain Country School. For example, when Grandin was facing criticism for her hug box at Franklin Pierce College, it was Carlock who suggested that Grandin undertake scientific experiments to evaluate the efficacy of the device. It was his constant guidance to Grandin to refocus her rigid obsessions with the hug box into a productive assignment that allowed this study undertaken by Grandin to be subsequently widely cited as evidence of Grandin's resourcefulness. After she graduated in 1966 from Mountain Country School, Grandin went on to earn her bachelor's degree in human psychology from Franklin Pierce College in 1970, a master's degree in animal science from Arizona State University in 1975, and a doctoral degree in animal science from the University of Illinois at Urbana–Champaign in 1989. Grandin is a prominent and widely cited proponent for the humane treatment of livestock for slaughter. She is also internationally famous as a spokesperson on autism. Steve Silberman in his book NeuroTribes wrote that Temple Grandin helped break down years of shame and stigma because she was one of the first adults to publicly disclose that she was autistic. Bernard Rimland, a father of a son with autism and author of the book Infantile Autism, wrote the foreword to Grandin's first book Emergence: Labeled Autistic. The book was published in 1986. Dr. Rimland wrote "Temple's ability to convey to the reader her innermost feelings and fears, coupled with her capacity for explaining mental processes will give the reader an insight into autism that very few have been able to achieve." In her later book Thinking in Pictures, published in 1995, the neurologist Oliver Sacks wrote at the end of the foreword that the book provided "a bridge between our world and hers, and allows us to glimpse into a quite other sort of mind." In her early writings, Grandin made the mistake of presenting herself as a recovered autistic and in his foreword, Bernard Rimland used the term recovered autistic individual. In her later writings, this has been removed. Steve Silberman wrote, "It became obvious to her, however, that she was not recovered but had learned with great effort to adapt to the social norms of the people around her." When her book Thinking in Pictures was written in 1995, Grandin thought that all individuals with autism thought in photographic specific images the way she did. When the expanded edition was published in 2006, she now realized that it had been wrong to assume that every person with autism processed information the same way she did. In this edition, she wrote that there were three types of specialized thinking. They were: 1. Visual Thinkers like her who think in photographically specific images. 2. Music and Math Thinkers – these people think in patterns and may be good at mathematics, chess, and programming computers. 3. Verbal Logic Thinkers – These people think in word details and their favorite subject may be history. In one of her later books, The Autistic Brain: Thinking Across the Spectrum, the concept of three different types of thinking in autism is further developed. This book was published in 2013. An influential book which helped her develop her concept of pattern thinking was Clara Claiborne Park's book titled Exiting Nirvana: A Daughter's Life with Autism. It was published in 2001. The Autistic Brain also contains an extensive review of scientific studies that provide evidence that object visual thinking is different from spatial visualization abilities. Based on personal experience, Grandin advocates early intervention to address autism and supportive teachers, who can direct fixations of the child with autism in fruitful directions. She has described her hypersensitivity to noise and other sensory stimuli. She says words are her second language and that she thinks "totally in pictures," using her vast visual memory to translate information into a slideshow of mental images that can be manipulated or correlated. Grandin attributes her success as a humane livestock facility designer to her ability to recall detail, which is a characteristic of her visual memory. Grandin compares her memory to full-length movies in her head, that may be replayed at will, allowing her to notice small details. She also is able to view her memories using slightly different contexts by changing the positions of the lighting and shadows. As a partial proponent of neurodiversity, Grandin does not support eliminating autism genes or treating mildly autistic individuals. However, she believes that autistic children who are severely handicapped need therapy with applied behavioral analysis. Additionally, she has claimed that she only will attend talks given by autistics that can hold down a career. By contrast, Jonathan Mitchell describes Grandin as making generalizations about autistic people, saying that many autistics aren't visual thinkers and that her generalizations trivialize the difficulties associated with autism. The autism rights activist Amy Sequenzia has criticized Temple Grandin for only focusing on and listening to high-functioning autistics, as opposed to low-functioning and non-speaking autistics. She has said that Grandin doesn't view those autistics as worthy of her attention. In 1980 she published her first two scientific articles on beef cattle behavior during handling: "Livestock Behavior as Related to Handling Facilities Design" in the International Journal for the Study of Animal Problems, Vol. 1, pp. 33-52 and "Observations of Cattle Behavior Applied to the Design of Cattle Handling Facilities", Applied Animal Ethology, Vol. 6, pp. 19-31. She was one of the first scientists to report that animals are sensitive to visual distractions in handling facilities such as shadows, dangling chains, and other environmental details most people do not notice. When she got her Ph.D. at the University of Illinois, she studied the effects of environmental enrichment on pigs. The title of her dissertation was "Effect of Rearing Environment and Environmental Enrichment on the Behavior and Neural Development in Young Pigs". Grandin expanded on these theories in her book Animals Make Us Human. In 1993, she edited the first edition of Livestock Handling and Transport. She wrote three chapters and had chapters from contributors from around the world. Subsequent editions of the book were published in 2000, 2007, and 2014. In her academic work as a professor at Colorado State University, her graduate student Bridgett Voisinet conducted one of the early studies that showed that cattle that remained calm during handling had higher weight gains. In 1997, when the paper was published, this was a new concept. The paper is titled "Feedlot Cattle with Calm Temperaments Have Higher Average Daily Gains Than Cattle with Excitable Temperaments", published in The Journal of Animal Science, Vol. 75, pp. 892-896. Another important paper published by Grandin was "Assessment of Stress During Handling and Transport", Journal of Animal Science, 1997, Vol. 75, pp. 249-257. This paper presented the idea that an animal's previous experiences with handling could have an effect on how it will react to being handled in the future, which was then a new concept in the animal-handling industry. A major piece of equipment that Grandin developed was a center track (double rail) conveyor restrainer system for holding cattle during stunning in large beef plants. The first system was installed in the mid-eighties for calves and a system for large beef cattle was developed in 1990. This equipment is now being used by many large meat companies. It is described in "Double Rail Restrainer Conveyor for Livestock Handling", first published in the Journal of Agricultural Engineering Research, Vol. 4, pp. 327-338 in 1988, and "Transferring results of behavioral research to industry to improve animal welfare on the farm, ranch, and slaughter plant", Applied Animal Behavior Science, Vol. 8, pp. 215-228, published in 2003. Grandin also developed an objective numerical scoring system for assessing animal welfare at slaughter plants. The use of this scoring system resulted in significant improvements in animal stunning and handling during slaughter. This work is described in "Objective scoring of animal handling and stunning practices in slaughter plants", Journal of the American Veterinary Medical Association, Vol. 212, pp. 36-39, "The feasibility of using vocalization scoring as an indicator of poor welfare during slaughter", Applied Animal Behavior Science, Vol. 56, pp. 121–128, and "Effect of animal welfare audits of slaughter plants by a major fast food company on cattle handling and stunning practices", Journal of the American Veterinary Medical Association, Vol. 216, pp. 848–851. Grandin is the author or co-author of over 60 peer reviewed scientific papers on a variety of other animal behavior subjects. Some of the other subjects are: the effect of hair whorl position on cattle behavior, preslaughter stress and meat quality, religious slaughter, mothering behavior of beef cows, cattle temperament, and causes of bruising. She has lectured widely about her first-hand experiences of the anxiety of feeling threatened by everything in her surroundings, and of being dismissed and feared, which motivates her work in humane livestock handling processes. She studied the behavior of cattle, how they react to ranchers, movements, objects, and light. Grandin then designed adapted curved corrals, intended to reduce stress, panic and injury in animals being led to slaughter. This has proved to be a further point of criticism and controversy among animal activists who have questioned the congruence of a career built on animal slaughter alongside Grandin's claims of compassion and respect for animals. While her designs are widely used throughout the slaughterhouse industry, her claim of compassion for the animals is that because of her autism she can see the animals' reality from their viewpoint, that when she holds an animal's head in her hands as it is being slaughtered, she feels a deep, godlike connection to them. Her business website promotes improvement of standards for slaughterhouses and livestock farms. The "squeeze machine" itself remains on sale at US$4525 each from Therafin Corporation. In 2004, she won a "Proggy" award in the "Visionary" category, from People for the Ethical Treatment of Animals. One of her notable essays about animal welfare is "Animals Are Not Things", in which she posits that technically, animals are property in society, but the law ultimately gives them ethical protections or rights. She compares the properties and rights of owning cows, versus owning screwdrivers, enumerating how both may be used to serve human purposes in many ways, but when it comes to inflicting pain, there is a vital distinction between such "properties"; legally a person can smash or grind up a screwdriver, but cannot torture an animal. Her insight into the minds of cattle has taught her to value the changes in details to which animals are particularly sensitive and to use her visualization skills to design thoughtful and humane animal-handling equipment. She was named a fellow of the American Society of Agricultural and Biological Engineers in 2009. In 2012, when the American beef industry was struggling with public perception of its use and sale of pink slime, Grandin spoke out in support of the food product. She said, "It should be on the market. It should be labeled. We should not be throwing away that much beef." “ I think using animals for food is an ethical thing to do, but we've got to do it right. We've got to give those animals a decent life, and we've got to give them a painless death. We owe the animals respect. Grandin says that "the part of other people that has emotional relationships is not part of me", and she has neither married nor had children. She later stated, for example, that she preferred the science fiction, documentary, and thriller genre of films and television shows to more dramatic or romantic ones. Beyond her work in animal science and welfare and autism rights, her interests include horse riding, science fiction, movies, and biochemistry. She has noted in her autobiographical works that autism affects every aspect of her life. She has to wear comfortable clothes to counteract her sensory processing disorder and has structured her lifestyle to avoid sensory overload. She regularly takes antidepressants, but no longer uses a squeeze-box (hug machine), a device which she invented at the age of 18 as a form of stress relief therapy, stating in February 2010 that: "It broke two years ago, and I never got around to fixing it. I'm into hugging people now." In 2010, Grandin was named in the Time 100 list of the one hundred most influential people in the world in the "Heroes" category. In 2011, she received a Double Helix Medal. She has received honorary degrees from many universities including McGill University in Canada (1999), and the Swedish University of Agricultural Sciences (2009), Carnegie Mellon University in the United States (2012), and Emory University (2016). In 2015, she was named an Honorary Fellow of the Society for Technical Communication. In 2012, Grandin was inducted into the Texas Trail of Fame. Grandin received a Meritorious Achievement Award from the World Organisation for Animal Health (OIE) in 2015. In 2016, Grandin was inducted into the American Academy of Arts and Sciences. In 2017, Grandin was inducted into the National Women's Hall of Fame. Grandin has been featured on major media programs, such as Lisa Davis' It's Your Health, ABC's Primetime Live, the Today Show, Larry King Live, and Fresh Air with Terry Gross. She has been written up in TIME magazine, People magazine, Discover magazine, Forbes, and The New York Times. In 2012, Grandin was interviewed on Thriving Canine Radio to discuss "A Different Perspective on Animal Behavior". She was the subject of the Horizon documentary, "The Woman Who Thinks Like a Cow", first broadcast by the BBC on June 8, 2006, and Nick News with Linda Ellerbee in the spring of 2006. She also has been the subject of the first episode in the series First Person by Errol Morris. Grandin is the focus of a semi-biographical HBO film, titled Temple Grandin, starring Claire Danes as Grandin. The film was broadcast on February 6, 2010. The movie was nominated for 15 Primetime Emmy Awards and won seven awards, including Outstanding Television Movie and Outstanding Lead Actress in a Miniseries or Movie for Claire Danes. Grandin was on stage as the award was accepted, and she spoke briefly to the audience. Coincidentally, the 62nd Primetime Emmy Awards happened on Grandin's birthday – August 29. On January 16, 2011, at the 68th Golden Globe Awards, Claire Danes won the Golden Globe Award for Best Actress – Miniseries or Television Film. Grandin was featured in Beautiful Minds: A Voyage Into the Brain, a documentary produced in 2006 by colourFIELD tell-a-vision, a German company. She was named one of 2010's one hundred most influential people in the world by Time magazine. In 2011, she was featured in an episode of the Science documentary series Ingenious Minds, and in 2018, Dr. Grandin will be featured in the upcoming documentary This Business of Autism exploring Autism Employment and the success story of Autism Employers such as Spectrum Designs Foundation produced by Mesh Omnimedia. She also was interviewed by Michael Pollan in his best-selling book The Omnivore's Dilemma, in which she discussed the livestock industry. Folk-punk band AJJ, formerly known as Andrew Jackson Jihad, included two songs called "Temple Grandin" and "Temple Grandin Too" on their LP Christmas Island. In 2018, Grandin was noted/profiled in the book Rescuing Ladybugs by author and animal advocate Jennifer Skiff as a "global hero" for "standing her ground and fighting for change after witnessing the extreme mistreatment of animals" used in farming. Livestock handling and transport (2007). ISBN 978-1-84593-219-0. CABI, UK. ^ Montgomery, Sy (April 3, 2012). Temple Grandin: How the Girl Who Loved Cows Embraced Autism and Changed the World. Houghton Mifflin Books for Children. ISBN 0547443153. ^ a b c Hauser, Marc (April 29, 2010). "Temple Grandin". Time. Retrieved April 14, 2019. ^ Cutler, Eustacia (2004). A Thorn in My Pocket: Temple Grandin's Mother Tells the Family Story. p. 204. ISBN 9781932565164. ^ a b Cutler, Eustacia (2004). "10". A Thorn in My Pocket: Temple Grandin's Mother Tells the Family Story. ISBN 9781932565164. ^ "Anna Eustacia Purves". Geni.com. Retrieved April 14, 2019. ^ a b Grandin, Temple. "Temple Grandin: An Inside View of Autism". Autism Research Institute. Retrieved April 14, 2019. ^ a b "Ben Cutler, 96, Whose Bands Entertained the Society Set". The New York Times. January 15, 2001. ISSN 0362-4331. Retrieved April 14, 2019. ^ Cutler, Eustacia (2004). A Thorn in My Pocket: Temple Grandin's Mother Tells the Family Story. p. 205. ISBN 9781932565164. ^ Federal Writer's Project of the Works Progress Administration for the State of North Dakota (1990). The WPA Guide To 1930s North Dakota (2nd ed.). State Historical Society of North Dakota. pp. 193–194. ISBN 1891419145. ^ Sacks, Oliver (1996). An anthropologist on Mars: Seven paradoxical tales. New York: Vintage Books: A division of Penguin Random House, LLC. p. 282. ^ a b Grandin, Temple; Scariano, Margaret M. (1996). Emergence: Labeled Autistic. Grand Central Publishing. p. 91. ISBN 9780446671828. ^ a b c "Interview with Temple Grandin". January 2, 2006. Retrieved April 14, 2019. ^ Grandin, Temple (2013). The Autistic Brain. Houghton Mifflin Harcourt. ISBN 0547636458. ^ Hughes, Virginia (October 14, 2012). "Researchers reveal first brain study of Temple Grandin". SpectrumNews.org. Simons Foundation. Retrieved April 14, 2019. ^ Nuwer, Rachel (October 17, 2012). "What Makes Temple Grandin's Brain Special?". SmithsonianMag.com. Smithsonian Institution. Retrieved April 14, 2019. ^ Stix, Gary (October 19, 2012). "A Little Hard Science from the Big Easy: Temple Grandin's Brain and Transgenic Sniffer Mice". ScientificAmerican.com. Springer Nature. Retrieved April 14, 2019. ^ McGowan, Kat (March 13, 2013). "Exploring Temple Grandin's Brain". Discover Magazine. Kalmbach Publishing. Retrieved April 14, 2019. ^ Grandin, Temple (1995). Thinking in Pictures: And Other Reports from My Life with Autism. New York: Doubleday. ISBN 9780385477925. 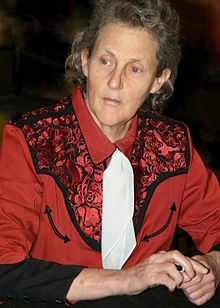 ^ "Temple Grandin Inducted into Colorado Women's Hall of Fame". March 8, 2012. Archived from the original on December 28, 2013. Retrieved April 14, 2019. ^ a b c "How the squeeze machine came to be". Aspergers Test Site. June 6, 2013. Retrieved April 14, 2019. ^ a b Grandin, Temple (Spring 1992). "Calming Effects of Deep Touch Pressure in Patients with Autistic Disorder, College Students, and Animals". Journal of Child and Adolescent Psychopharmacology. Mary Ann Liebert, Inc. 2 (1): 63–72. doi:10.1089/cap.1992.2.63. PMID 19630623. Retrieved April 14, 2019. ^ "Temple Grandin". apbspeakers.com. Retrieved April 14, 2019. ^ Grandin, Temple (2008). The Way I See It: A Personal Look at Autism and Aspberger's. Future Horizons. ISBN 9781932565720. Retrieved April 14, 2019. ^ Grandin, Temple (2009). "How does visual thinking work in the mind of a person with autism? A personal account". Philosophical Transactions of the Royal Society B. 364 (1522): 1437–1442. doi:10.1098/rstb.2008.0297. PMC 2677580. PMID 19528028. ^ Sandison, Ron (April 13, 2017). "Temple Grandin To Autistic Adults: Get Your Butts Out Of The House And Get A Job". The Art of Autism. Retrieved April 14, 2019. ^ Osborne, Lawrence (2002). American Normal: The Hidden World of Asperger Syndrome. New York: Copernicus. pp. 114–115, 155, 158–159. ISBN 978-0-387-95307-6. ^ Sequenzia, Amy (January 19, 2013). "When Autistics Grade Other Autistics". Ollibean. Retrieved April 14, 2019. ^ Sequenzia, Amy. "Amy Sequenzia". Facebook.com. Retrieved April 14, 2019. ^ Coe, Sue (2012). Cruel: bearing witness to animal exploitation. New York: OR Books. p. 64. ISBN 978-1-935928-72-0. ^ Therafin Corporation. "We manufacture the Squeeze Machine (some people call it hug machine)". therafin.com. Retrieved 28 August 2018. The price of the complete system with air compressor is $4525.00 plus shipping. ^ "2004 PETA Proggy Awards". PETA. September 9, 2004. Archived from the original on August 8, 2009. Retrieved April 14, 2019. ^ "Animals are not things". Retrieved April 14, 2019. ^ "ASABE Fellows" (PDF). American Society of Agricultural and Biological Engineers (ASABE). Archived from the original (PDF) on October 30, 2017. Retrieved April 14, 2019. ^ Carman, Tim (May 23, 2012). "Animal scientist Temple Grandin supports 'pink slime'". Washington Post. Retrieved April 14, 2019. ^ Wallis, Claudia (February 4, 2010). "Temple Grandin on Temple Grandin". Time Magazine. Retrieved April 14, 2019. ^ "Double Helix Medals of 2011". Cold Spring Harbor Laboratory. Archived from the original on January 6, 2013. Retrieved April 14, 2019. ^ Grandin, Temple. "Temple Grandin Ph.D". Retrieved April 14, 2019. ^ "Recognition Monday: Temple Grandin Named Honorary Fellow". Society for Technical Communication. Retrieved April 14, 2019. ^ "Temple Grandin". Western Heritage from the Texas Trail of Fame. Retrieved April 14, 2019. ^ "Opening of the 83rd General Session of the World Assembly of Delegates of the World Organisation for Animal Health". The World Organisation for Animal Health (OIE). May 24, 2015. Archived from the original on September 20, 2015. Retrieved April 14, 2019. ^ "American Academy of Arts and Sciences Elects 213 National and International Scholars, Artists, Philanthropists, and Business Leaders". American Academy of Arts and Sciences. April 20, 2016. Retrieved April 14, 2019. ^ "Ten women added to National Women's Hall of Fame in Seneca Falls". September 17, 2017. Retrieved April 14, 2019. ^ Dimas, Jennifer (February 10, 2017). "Temple Grandin named to the National Women's Hall of Fame". Colorado State University. Retrieved April 14, 2019. ^ Sanchez, Hayley (February 18, 2017). "Temple Grandin will be inducted into National Women's Hall of Fame, Q&A". The Denver Post. Retrieved April 14, 2019. ^ "Dr. Temple Grandin". TempleGrandin.com. Retrieved April 14, 2019. ^ Klinkenborg, Verlyn (May 1, 2005). "What Do Animals Think?". Discover Magazine. Retrieved April 14, 2019. ^ "The Woman who thinks like a Cow". Horizon. BBC. November 2006. Retrieved April 14, 2019. ^ Roybal, Joe (October 31, 2008). "Temple Grandin Talks About Her Upcoming HBO Biopic". BEEF Magazine. Retrieved April 14, 2019. ^ Harris, Will (April 2, 2010). "A Chat with Temple Grandin". premiumhollywood.com. Retrieved April 14, 2019. 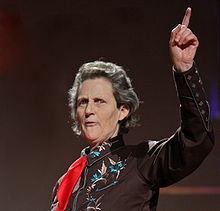 ^ "'Temple Grandin' Scores Big Emmy Win For HBO". CBSNews.com. August 30, 2010. Retrieved April 14, 2019. ^ "This Business of Autism Debuts to Sold Out Crowd". June 6, 2018. Retrieved April 14, 2019. ^ "A Teacher's Guide to the Omnivore's Dilemma: A Natural History of Four Meals" (PDF). ^ Skiff, Jennifer (2018). Rescuing Ladybugs: Inspirational Encounters with Animals That Changed the World. New World Library. ISBN 9781608685028. ^ Skiff, Jennifer (2018). Rescuing Ladybugs: Inspirational Encounters with Animals That Changed the World. New World Library. p. 170. ISBN 9781608685028.